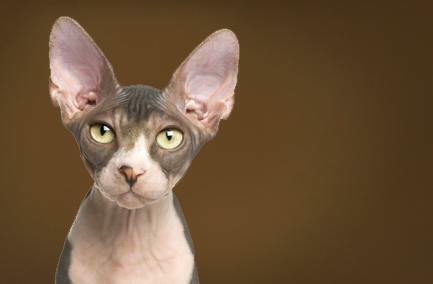 The most distinctive feature of this cat is its appearance of hairlessness. The Sphynx is of medium size and body conformation with surprising weight for its size. Females are generally smaller than males. The body feels warm and soft to the touch, with a skin texture akin to either a soft peach or a smooth nectarine. The Sphynx is sweet-tempered, lively, and amenable to handling. Coat colours: Black, Red, Blue, Cream, Chocolate, Cinnamon, Lavender, Fawn, White and Bi-Colours. For obvious reasons they are prone to sunburn and hypothermia and must be indoors only. Their skin is often oily and requires bathing and wiping. They are people friendly and social as pets but it takes a while to get used to their baldness.